The devastation of the American Civil War is well known; casualties in that fraternal bloodbath exceeded 750,000 and the South was wrecked. Less known and understood is the toll the war exacted on the survivors. Often considered the “lucky” ones, thousands of veterans found their way home only to settle into obscurity and tedium. Of course, there were many who did not come home whole physically. They arrived on crutches and would bear the scar of war for the rest of their lives. And then there were the vets who seemed whole on first glance, but were far from well – suffering the lingering effects of disease, malnutrition, and/or mental illness. This is the story that is not often told; the tale of the Union soldier who would continue to battle for health, for livelihood, and for respect. Finding issue with the notion that “the mood of the country reinforced the veteran inclination to pay as little heed as possible to the memories of the war (68),” as argued by historian Gerald Linderman, Jordan argues that “the determination of northern civilians to leave the war behind ensured that Union veterans could not (69).” Indeed they sought fraternity with their fellows with the creation of veterans’ organizations like the Grand Army of the Republic or the Old Soldiers Society in Iowa and the New Hampshire Grand Veteran League. After living for years in military camps with all the attendant sights and smells, and experiencing the sensory overload of “seeing the elephant,” former soldiers ached for a return to those heady days amidst the sensory dullness of civilian life. One such case was Oliver Perry Newberry of Missouri who recorded his failure to adjust to a life of peace. “Cool reason runs dethroned and anarchy and confusion reigns supreme where common sense should be the chief ruler (70),” Newberry wrote. Sadly, it was not until after World War II those attitudes toward Union veterans began to change. “No longer menacing reminders of the nation’s rift, they were heroic symbols of what turned out to be a monumental turning point in American history (201).” In the afterglow of the war Americans could once again revel in the valor and sacrifice of the Civil War veteran – North and South. Still the causes of the Civil War faded into the background and it was stressed that both sides fought bravely for their causes. Great men were celebrated, especially Robert E. Lee, who was pronounced America’s greatest soldier. So while Union veterans, mostly dead by the post-World War II era, regained a measure of dignity the Lost Cause also saw a resurgence. Jordan, Brian Matthew. 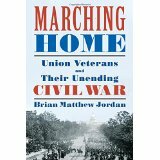 Marching Home: Union Veterans and Their Unending Civil War. (New York: Liveright Publishing Corp., 2014). This entry was posted in Battlefields & Historic Places, Battles, Book Review, Books & Authors, Civilian, Common Soldier, Emerging Civil War, Holidays, Memory, Politics, Reconstruction and tagged Civil War, Pensions, Reconstruction, Union veterans. Bookmark the permalink. Very good review, Derek. You skillfully identified many of the issues that historians even overlook about the aftermath of the Civil War. The “lingering war issues” of Civil War veterans are especially interesting to me now as I am researching a novel (a third book in a Civil War trilogy about my 82nd Ohio ancestor who spent 17 months as a pow–see Hiram’s Honor). Thanks again for this well-done review of a book I hope gets much attention. Another book on this topic is Across the Bloody Chasm by M. Keith Harris. Sounds awesome. I love to read stuff like that. I am working on one myself about my six great grandfathers who all wore blue.